"Psychological Investigations" lets readers listen in on one of the most exciting developments in psychology today as it is unfolding. With the current trend in therapy reflecting a movement away from traditional psychology and towards more postmodern psychologies, social therapy, a psychotherapeutic approach developed by Fred Newman, emerges as a qualitatively new way of doing therapy. Social therapy blends philosophy, the arts, and political concerns into a group approach that focuses on improved social functioning. 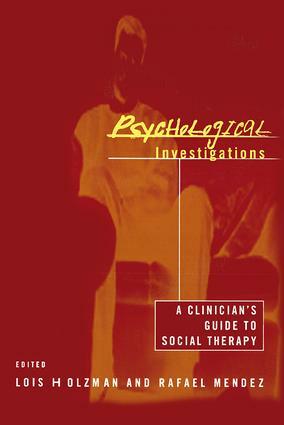 "Psychological" "Investigations" provides insight into the revolutionary development of social therapy--an improvisational, investigatory, development-focused method of treatment. Featuring dialogues drawn from transcripts of teaching and supervisory sessions between Newman and therapists, the book presents a comprehensive guide to the core philosophical and political issues of social therapy and the social therapeutic group process. Instead of introspection and insight--traditional means to self-realization--Newman and social therapy encourages activity, involvement and commitment to causes larger than the individual ego. E. What's Wrong With Truth Talk?